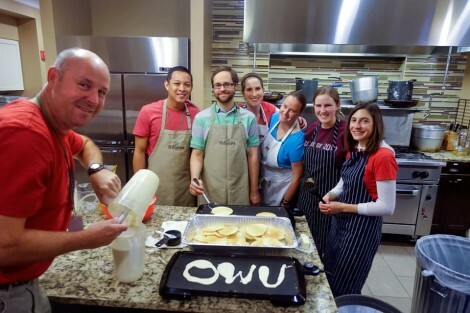 Ohio Wesleyan alumni participate in a community service project in Chicago that includes taking a moment to make ‘OWU’ pancakes. Alumni in seven cities are taking part in this year’s Bishops in Service Week. Think about Ohio Wesleyan, and service often comes to mind. As students, we learn about opportunities to serve others on campus, in the surrounding community, and around the world. It’s no surprise, then, that four years ago, OWU’s Bishops in Service Week was created to help alumni fulfill their desire to participate in community service and stay connected with each other. Working with OWU’s alumni relations office, graduates from seven major cities including Washington, D.C., and Cincinnati, will celebrate the fourth annual Bishops in Service Week beginning October 11 by supporting local charity groups. The idea started in Columbus, Ohio, as OWU alumni helped with quarterly service events that quickly caught the attention of alumni in various other cities. What began with four cities has since expanded to seven, each committed to a week of service events to help better their communities. The number of alumni working varies depending on the organization, but usually includes 15-20 people per service event. The majority of these alumni groups work with local food banks. However, graduates in a few cities have incorporated different philanthropy events and created bonds with other service organizations. The Chicago alumni group, for example, will visit a local Ronald McDonald House to host a breakfast for families staying there. The Columbus group will assist a furniture bank to organize and properly store donated furniture. The D.C. Bishop alumni have the honor of escorting World War II and Korean War veterans flown to Washington at no cost by Honor Flight Columbus as the veterans visit war memorials. Bishops in Service Week has received strong support from OWU graduates in participating cities and likely will continue to expand.